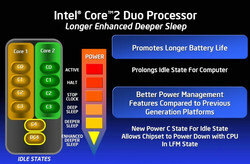 The Intel Core Duo processor is Intel's first mobile dual core processor for notebooks and a key component of the Intel Centrino processor technology. It belongs to the Core processor family, is based on the Pentium M architecture (two improved Pentium M cores) and the direct predecessor of the Intel Core 2 Duo notebook processors, which were introduced in July 2006. 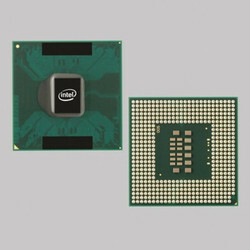 The Intel Core Duo processor integrates two 32-Bite cores (based on the Pentium M), which are optimised for mobile operation in a single processor. Therewith, it is possible to run threads and application in separate cores with separate CPU resources in parallel and, so, the performance can increase depending on the other hardware components if this feature is supported by the operating system and the software. Later on the design of the Core Duo was reused for the Pentium Dual-Core (an inexpensive alternative to the Core 2 Duo and a direct competitor of the Turion (64) X2 processors). After first benchmarks it gets obvious that the Core Duo is at least equally fast than a Pentium M with same clock speed in all tests. In all applications designed for multi processors the performance is nearly double the performance of the Pentium M (e.g., 86% faster in CineBench). 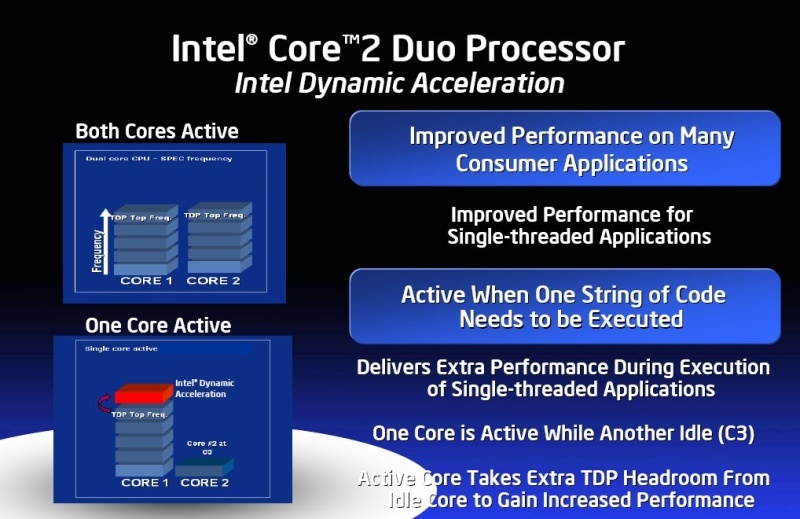 All Core Duo processors are produced in 65 nm technology and have 2 MB level 2 cache. Depending on the model the front-side-bus works either on 667 MHz or on 533 MHz (ultra-low-voltage models). The ultra-low-voltage models require 9.0 Watt, the low-voltage models 15 Watt, all other have an energy demand of 13 Watt. The clock rates of this processor series ranges from 1.06 GHz up to 2.33 GHz. Furthermore, all models implement Intel's Enhanced Speedstep technology, and Execute-Disable-Bit and some of the Intel's Virtualisation technology. 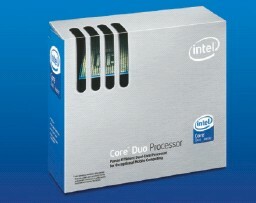 The Intel Core Duo is alike the Intel Core Solo and the Intel Xeon dual core processor LV based on the enhanced Pentium M processor microarchitecture. 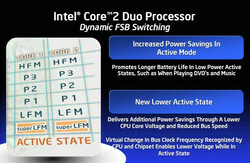 Intel Smart Cache, which improves the data sharing of the two processor cores. 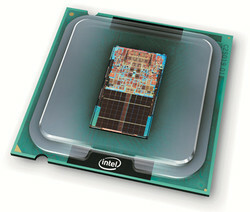 Intel Advanced-Thermal-Manager, which offers digital interfaces to the temperature sensor. 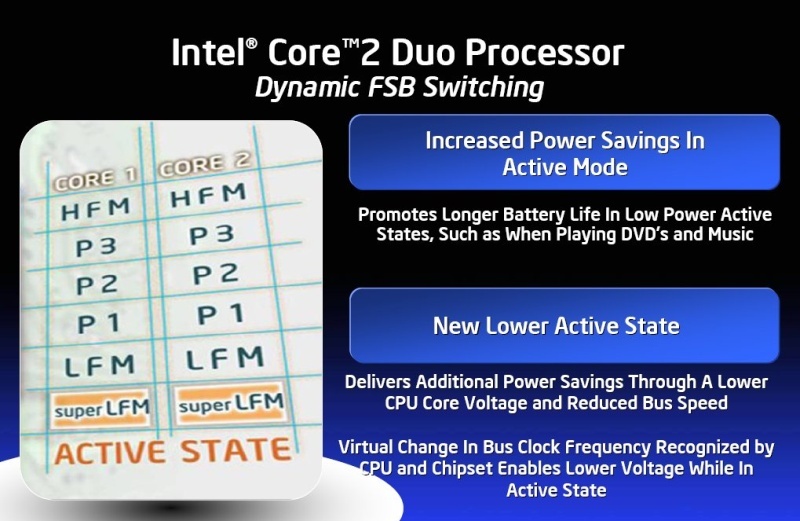 Two processor cores work inside a single processor component at the same clock frequency and share the L2 cache and the front side bus (FSB). prohibits security problems caused by buffer overflows if it is activated and supported by the operating system. 2 MB Level 2 Cache with enhanced cache architecture make the cache more efficient (compared to the Pentium M architecture). The Thermal Management system, which was enhanced compared to the Pentium M architecture, improves the control and, therefore, allows quieter, cooler, and slimmer notebooks. The Intel VT offers hardware support of virtual systems on a single computer (i.e., using more operating systems in parallel and isolated from each other, e.g., Xen or VMWare). The Digital-Media-Boost is an enhancement of the micro-architecture, which optimises instructions and improves the performance for the purpose of accelerating calculation intensive tasks like audio, and video processing, picture editing, 3D graphics and scientific calculations. On demand both cores are used or vice versa if the performance requirements are not that high one of the two cores will be deactivated. The enhanced Deeper Sleep allows an even lower minimum voltage than Deeper Sleep and, so, enhances the possibilities to save energy. Dynamic Cache Sizing is also an energy saving mechanism, which allows an automatic memory flush depending on the demands and in idle times. Depending on the load the SpeedStep Technology allows to switch between different states and to save energy if possible. 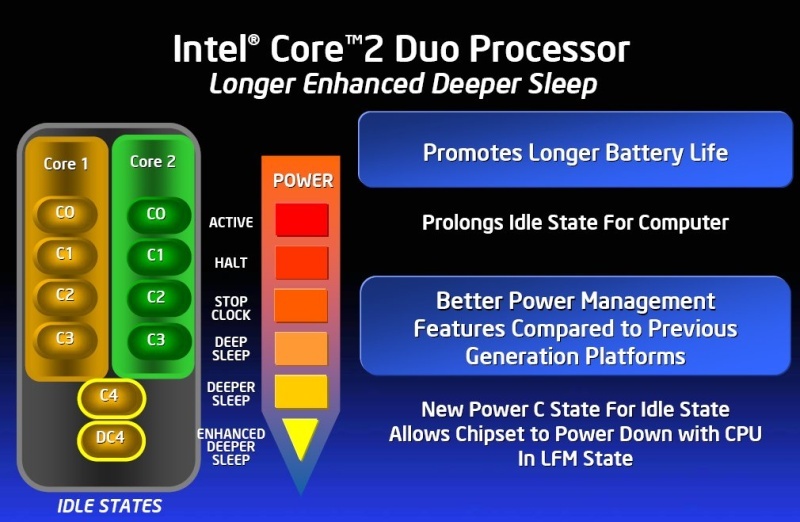 In our special article about the Core 2 Duo processor you can learn about differences between the Core Duo (Yonah) architecture and the Core 2 Duo (Merom). Der Core 2 Duo vor Einführung der Santa Rosa Platform basiert noch wie der Vorgänger auf das PGA Socket-M Interface. Dadurch ist es möglich manche Notebooks von einem Core Duo auf einen Core 2 Duo aufzurüsten. Nötig hierzu ist jedoch ein Bios das den Core 2 Duo unterstützt. Außerdem darf der Prozessor nicht mit dem Mainboard verlötet sein (wie beim BGA - Ball Grid Array - Gehäuse). Am 15 Juli 2008 stellte Intel im Zuge der Centrino 2 Plattform überarbeitete Penryn Prozessoren mit FSB 1066 und verringertem TDP (Stromverbrauch) vor. Besonders die neue 25 Watt P-Klasse soll leistungsfähige Prozessoren in kleine Laptops bringen. Im Jänner 2008 führte Intel neue T9xxx und T8xxx Core 2 Duo Prozessoren auf Basis des neuen "Penryn" Kerns vor. Diese Prozessoren werden in 45nm hergestellt (die Vorgänger noch in 65nm) und bieten einen größeren Level 2 Cache (3 und 6 MB, je nach Version - derzeit). Weiters bekam Penryn eine schnellere Divisionseinheit und 47 neue SSE Befehle (SSE4 getauft). Dank des neuen Produktionsprozesses konnte Intel die Taktraten steigern (bei gleichem Stromverbrauch). Nach ersten Messungen der c't war ein Penryn T9500 rund 5-10% schneller als ein ein gleichgetakteter Merom T7800. Bei wenigen Tests konnte die c't sogar bis zu 25% an Mehrleistung messen. Einzelne SPEC-Benchmarks des CPU2000 liefen jedoch sogar langsamer als beim Merom. Grundsätzlich führen sie die Mehrleistung (wenn messbar) hauptsächlich auf den größeren L2 Cache zurück. Weitere Informationen und Benchmarks finden Sie in unserem Intel Core 2 Duo „Penryn“ CPU Vergleichstest. Am 9. Mai 2007 wurde im Zuge der 4. Centrino Generation namens Santa Rosa auch der Core 2 Duo Prozessor erneuert. Der Prozessor basiert immer noch auf dem Merom Kern, wurde jedoch um einige Stromspar- und Optimierungsfunktionen erweitert. Ausserdem braucht er nun den neuen Socket P mit 478 Pins, der jedoch nicht mehr Pin-kompatibel mit dem Socket M der älteren Core 2 Duo ist. Im Unterschied zu den Vorgänger Core 2 Duo Prozessoren arbeiten die neuen CPUs nun mit FSB 800 (200 MHz Quad-pumped) anstatt FSB 667 (133 MHz Quad-pumped). Dieser unterstützt nun "Dynamic Front Side Bus Switching", wobei bei geringer Prozessorlast der FSB von 200 MHz auf bis zu 100 MHz (FSB 400) abgesenkt werden kann um Energie zu sparen. Diese Absenkung betrifft jedoch nur Chipsatz und Prozessor und wird daher "virtuell" genannt. Der Core 2 Duo kann sich dank Speedstep auf minimal 1.2 GHz runtertakten. Dank dem niedrigeren (virtuellen) FSB kann sich der "Santa Rosa" Core 2 Duo auf 800 MHz heruntertakten um noch mehr Strom zu sparen. Ein weiteres neues Feature ist das dynamische Übertakten eines Kerns namens "Dynamic Acceleration". Wenn nur ein Kern des Prozessors gefordert wird, dann kann sich der eine Kern dynamisch übertakten, während der zweite Kern in den stromsparenden C3-Modus verweilt. Dadurch kann der übertaktete Kern mit der Taktrate des nächshöheren Modells arbeiten (z.B. 2.2 statt 2.0 GHz beim T7300). Dadurch bleibt die TDP (Thermal Design Power) gleich und erfordert keine angepassten Kühllösungen. Wenn der Prozessor gerade keine Aufgabe zum Abarbeiten hat, begibt er sich in die unterschiedliche Sparzustände (C1 bis C4/DC4). Bei Santa Rosa sorgt der neue Chipsatz dafür, das der Prozessor so lange wie mögliche im Sparzustand verbleibt (z.B. fängt er Speicheranfragen ab). Processor numbers for the Intel Core CPU are categorized in 4-digit numerical sequences with an alphabetical prefix. All processors with leading 'T' have standard energy demand. Except of these there are also Lxxxx (low-voltage) and Uxxx (ultra-low voltage) processors available. Thereby a higher number hints on more features, but this can also mean that a processor features more of an aspect, but less of another. A detailed list of all models is available in our overview of mobile processors. A categorization according to performance of all mobile processors is available in our benchmark list of mobile processors.